Did I do okay? Part two… and a quick Cardi for the cold office! – Nice dress! Thanks, I made it!! 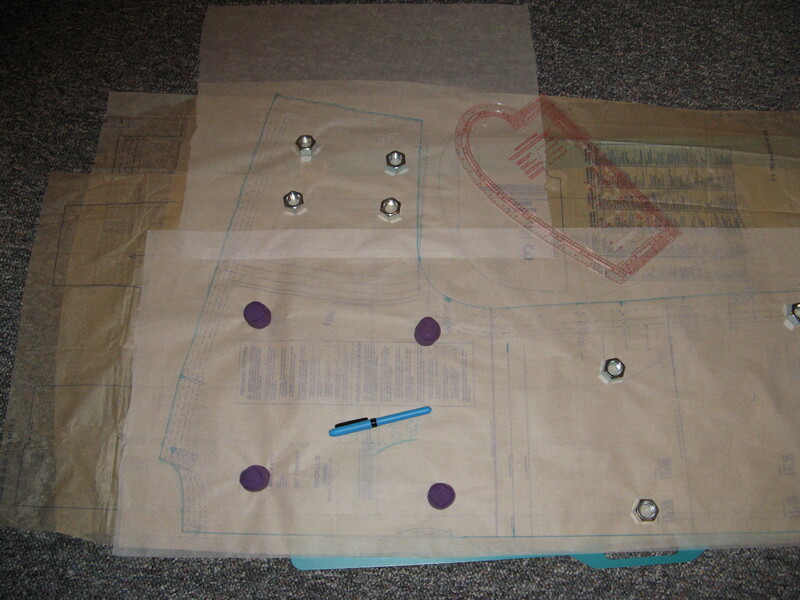 This time I placed my nicely ironed tissue pattern pieces, not cut out, on my cutting board, placed a sheet of tracing paper over top, weighted it, and traced the pattern piece I wanted on to the tracing paper with a lovely blue marker, putting on all the necessary markings too. Then I cut out my traced pattern piece and used it to cut out my material, transferring over all the necessary markings. The tracing paper is quite easy to see through, yet quite strong – it survived Sophie and Simon leaping on it without any damage, my tissue pattern pieces certainly never did! So my tissue pattern pieces are uncut and untouched and folded nicely back up into my envelope. 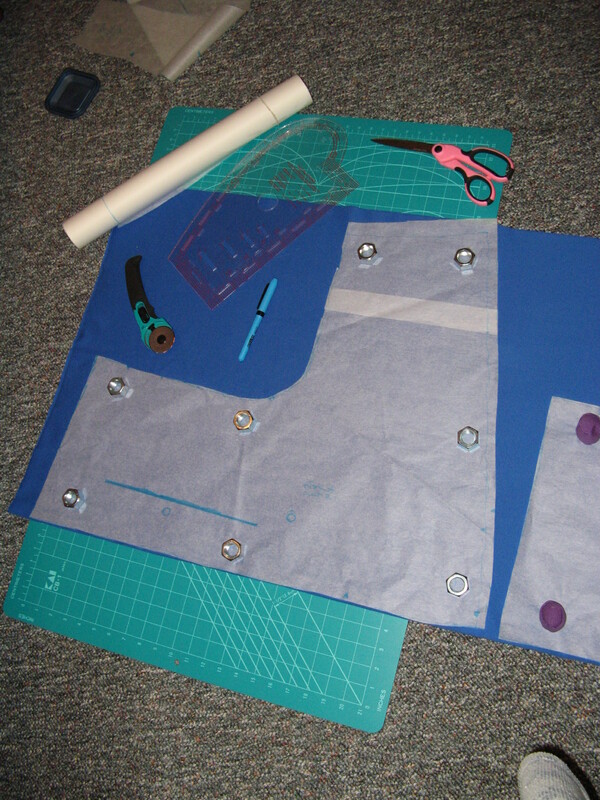 The traced pattern pieces can be saved to use again or discarded, whatever I choose! I need a quick Cardi for the office. I cannot believe how cold a heritage office building can get. The heat is on in the winter and the air-conditioning in the summer, but neither seems to be set right so we have to be ready to put on more layers or take more off! 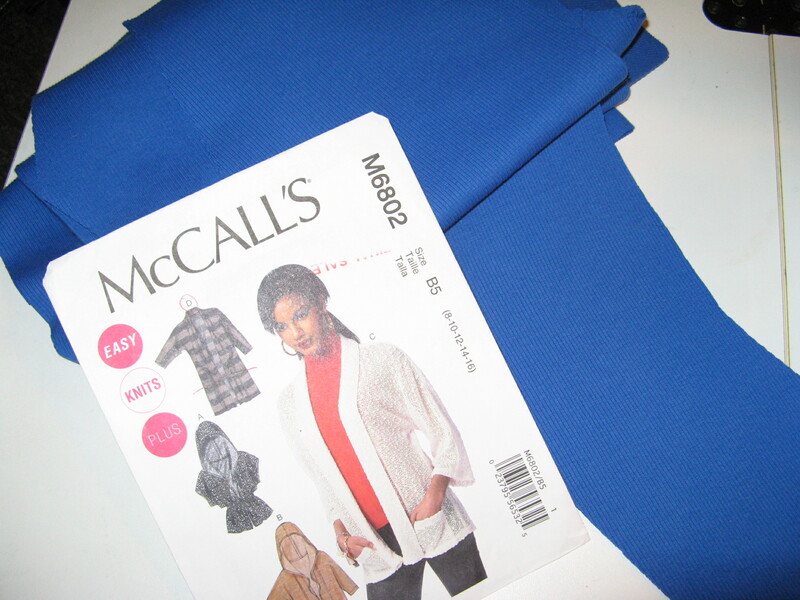 I have cut out view D of McCall’s M6802, but I am making it as short as view C. A total of two pattern pieces – front and back – plus pick whichever collar you like! 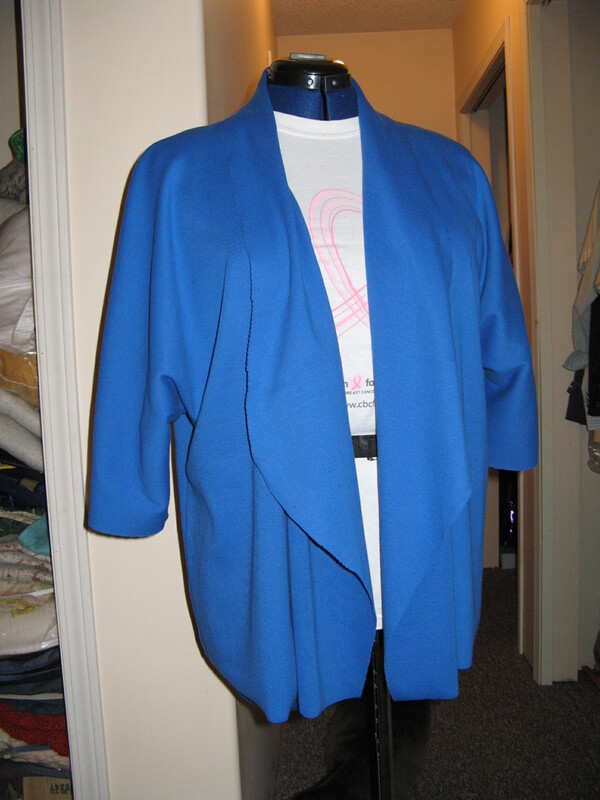 The pattern is marked Easy, and it is – 2 side seams, 2 long shoulder seams, and sew on your collar, and you are done! I am really happy with this lightweight knit and the short sleeves. I can be bundled up or not! BUT, there is a problem… where the collar was serged onto the cardigan, the inside seams show when the collar flaps open. Also if you put a traditional hem on the bottom edge and up and around the collar edge, the wrong side of the collar edge hem will show. Neither a pretty sight, for my taste at least. Sooo…. I have a quick fix! Just give me a minute. Here… Talk to Sophie while I am gone. 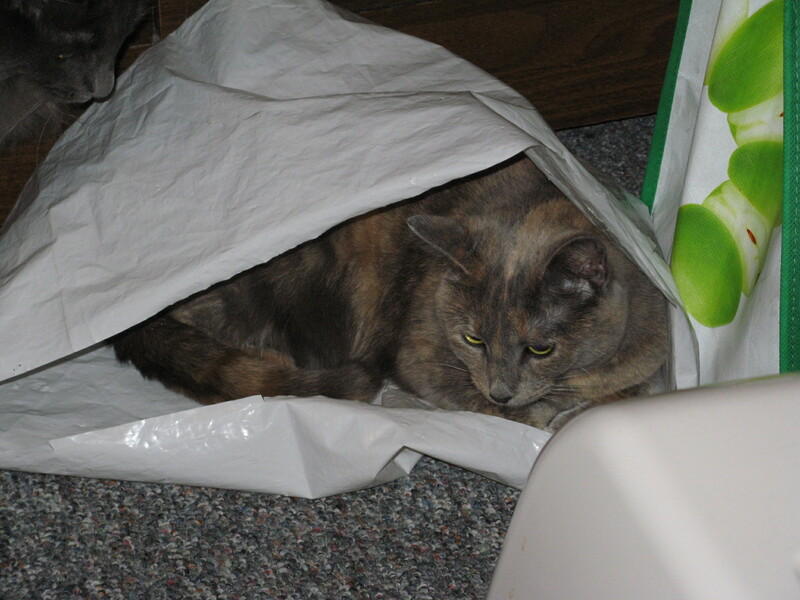 Sophie inside my Serger cover having a nap! My hat is off to you. Years ago I used to sew everything and spent the better part of each creation reading and re-reading the instructions because I hated to “pick” apart anything. As you say, “I have a quick fix” all the little hairs on the back of my neck all went up. You have more patience than I ever had and by the way, the Cardi looks great. Thank you! Almost finished my “quick fix”! I will show it to you soon. I would like to make something similar. Very nice. Nice job on the Cardi…oh and give my regards to Sophie! Thank you! She says HI! Back!